The teeming trillions of bacteria in the digestive tracts of mice have been shown to affect the animals' brain development and behaviour. Mice bred in sterile environments without these "gut flora" were seen to be more adventurous and less anxious than mice with normal gut flora. The research adds weight to the idea that gut bacteria are a critical part of the overall development of mammals. Gut flora were once thought to be harmless residents of the guts of mammals, and in time it became clear that they not only aid in digestion but also protect against the arrival of more harmful invaders. But research in recent years has shown an increasingly complex picture in which the bugs play significant roles in several critical bodily systems, having already been implicated in obesity, asthma, and liver function. "Germ-free" mice, born without the bugs and protected from their arrival, have shown a number of effects distinct from mice born in the normal way. "We know that animals in 'germ-free' conditions can reproduce, they have a longer lifespan, and they seem to live perfectly OK, provided you don't expose them to stress or damage," said Sven Pettersson, the Karolinska Institute microbiologist who, along with neuroscientist Rochellys Diaz Heijtz, led the research. "The moment you do that they're much more fragile - that means there are certain aspects of life which seem to be taking place in the absence of microorganisms, but there are clearly aspects connected to the presence of them," he told BBC News. Professor Petterson and his colleagues bred a number of mice under normal and germ-free conditions. In stantardised tests of activity, the germ-free mice explored more of an "open-field activity box", rearing up on their hind legs more often, and showed less of the signs associated with anxiety. In studies of the animals' brains, they showed higher levels of a number of hormones, and even differences in the expression of over 170 genes. 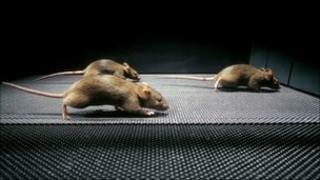 The result does not paint a clear picture of whether the development of the germ-free mice is specifically "better" or "worse" for the animals, Professor Pettersson explained, but is a "very, very interesting" first demonstration that the bugs can have such profound effects even within the brain. It follows a long line of studies that suggest the bugs are far more involved in mammalian function than just in their digestion. "Twenty years ago you wouldn't have expected this, but there's been a dramatic change in the view of what microorganisms like bacteria can do to host physiology," he said. "If you look at it from the perspective that life has existed for hundreds of millions of years, and man has been around for maybe just a fraction of this, that means the microorganisms were there long before us - so all aspects of life would have to involve an adaptation to them." How the bacteria effect these long-range changes in development and behaviour remains a mystery, so the group is aiming to first identify which bacterial species are implicated.